All events are by donation, which are gladly received at any event, online or by mail. No one is turned away for lack of funds. You are invited to attend all or any portion of the activities—whatever works for your schedule and inclination. There is also the opportunity to meet individually with a teacher. If you are new to Zen meditation, contact the teacher or leader to let them know you are coming so they can meet you 15 minutes before the event for instruction. You are also welcome to just come and dive in! Larkspur teacher Layla Smith Bockhorst (left) and students have tea during one of the weekly sittings at the Aikido Center. 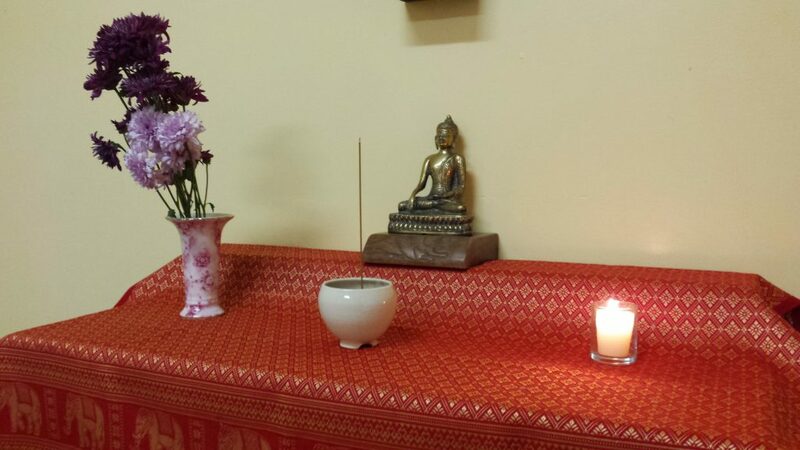 On Tuesdays, we sit one 40-minute period of zazen, followed by a reading, then tea and a Dharma talk and discussion. Fridays are zazen meditation only. Friday morning, 6:30 – 7:10 a.m. Led by Layla Smith Bockhorst. The Mt. 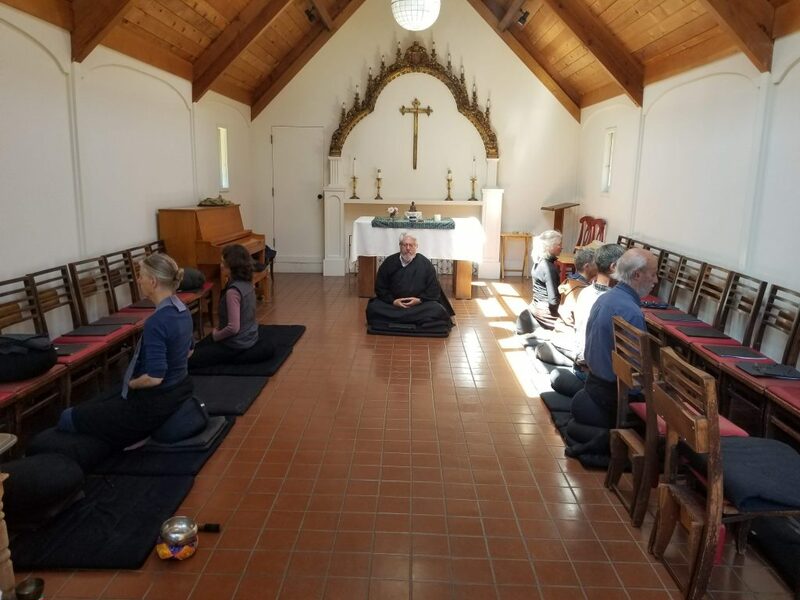 Source Bolinas meditation group sitting zazen in St. Aidan’s Episcopal Church, in Bolinas, CA, led by Anbo Stuart Kutchins. 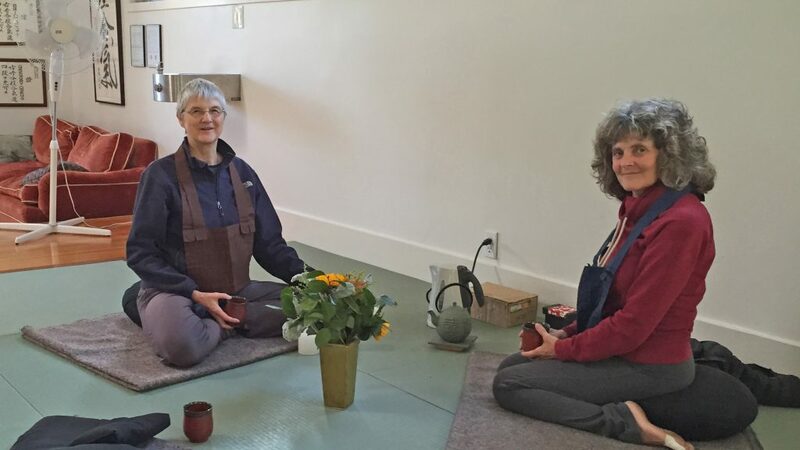 New Zen meditation offering in Bolinas: Every Friday 5 – 6 p.m. Monthly half-day sittings. The day includes zazen (sitting meditation), kinhin (walking meditation), a Dharma talk, discussion, and chanting. When: 9:00 a.m. – 2:30 p.m. on the first Saturday of each month. You are invited to join at any point during the day. $35 Donation suggested. Led by Anbo Stuart Kutchins. 1:30 – 2:30 p.m. Work period in support of St. Aidan’s church. Buddhist altar at the weekly San Francisco Mountain Source sitting. We meet as a peer group for sitting (zazen), followed by chanting and discussion. When: Thursday Evenings, 7:00-8:30 p.m.
Where: Saint James’ Episcopal Church, 4620 California Street, between 8th & 9th Avenues, San Francisco. Enter the courtyard through the gate, then through the white door at ground level about half way back on the church building on the left. Take the steps down to the church social hall. We meet in a smaller room down the short hallway to the left, on the street side of the building. Led by Ido Dan Gudgel.